The most comprehensive array of cardiovascular disease statistics from across Europe are published in European Heart Journal. This unique compendium, assembled by the European Society of Cardiology (ESC) focuses on the 56 ESC member countries and includes major risk factors for cardiovascular disease, disease prevalence and mortality in each. The ESC Atlas of Cardiology also features novel data on health infrastructure and cardiovascular services, provided by ESC member national cardiac societies. Other information sources include the World Health Organization (WHO), the Institute for Health Metrics and Evaluation, and the World Bank. However, the data show that unequal health outcomes are not an inevitable consequence of limited economic resource. For example, Bulgaria and Turkey – both middle income countries - report rates of cardiac catheterisation and coronary stenting that compare favourably with the best high income countries. The Atlas shows that the incident of cardiovascular disease continues to increase across nearly all European countries, despite declines in cardiovascular mortality. Professor Timmis said: “This no doubt reflects population growth and ageing because age-standardised data for men and women show consistent declines in cardiovascular disease prevalence across high income ESC member countries during the last 25 years.” In the middle income countries, the pattern is different with no clear evidence of decline during the same period. Indeed, just under half of these middle income countries recorded an increase in disease prevalence. Deaths due to cardiovascular disease in Europe are higher in women (2.1 million) than men (1.7 million). Cardiovascular disease also accounts for a larger proportion of all deaths in women (49%) compared with men (40%). However, fewer women than men died prematurely (under 70 years of age) from cardiovascular disease. 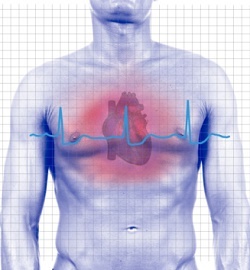 Among people under 65 years of age, cardiovascular disease remains the most common cause of premature death among men. In women, it is cancer.